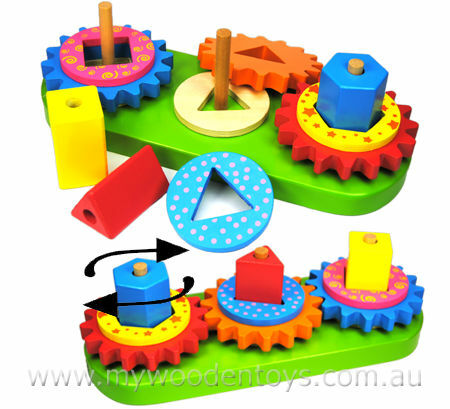 Stacking Wooden Geometric Gear Blocks brings together shape sorting and stacking, colour recognition and problem solving all in one very clever toy. This beautiful wooden toy has thirteen geometic brightly coloured pieces which all fit together onto three wooden spindles. When the toy is all together the cogs interlock and turn each other. Stacking Wooden Gear Blocks is a toy that will grow with your child as they develop more and more complex manipulation skills. Size: 29 x 11 x 10cm Cogs have a 10cm diameter. Material: Wood with child-safe paints. We like this because: "Hard to find a more engaging toy."